This picture was taken during the week of the 2008 summer solstice at Stonehenge in United Kingdom, and captures a picturesque sunrise involving fog, trees, clouds, stones placed about 4,500 years ago, and a 5 billion year old large glowing orb. 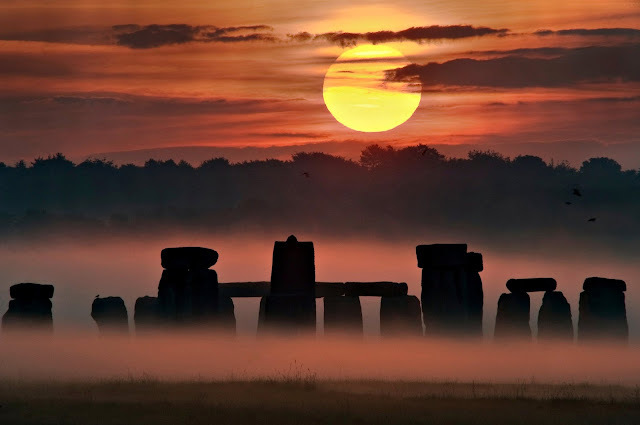 Even given the precession of the Earth's rotational axis over the millennia, the Sun continues to rise over Stonehenge in an astronomically significant way. As magnetic fields on the sun rearrange and realign, dark spots known as sunspots can appear on its surface. 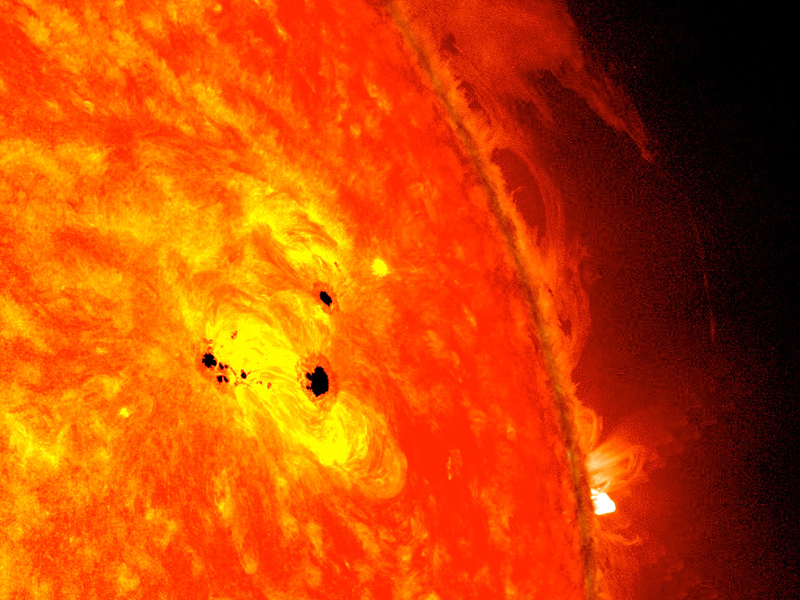 Over the course of Feb. 19-20, 2013, scientists watched a giant sunspot form in under 48 hours. 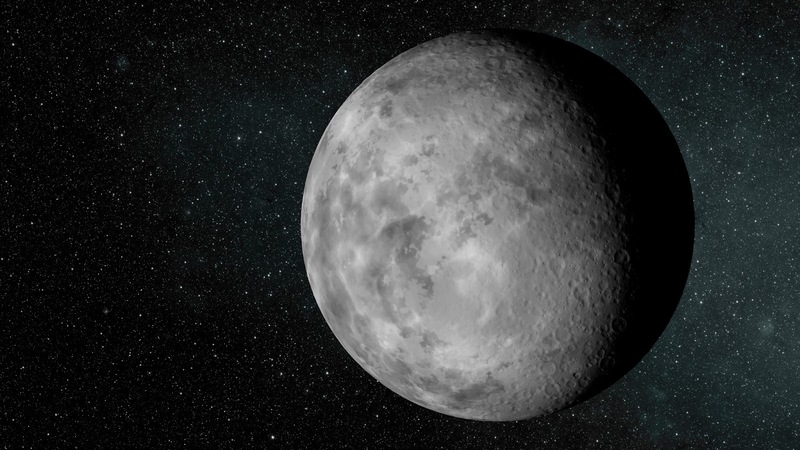 It has grown to over six Earth diameters across but its full extent is hard to judge since the spot lies on a sphere not a flat disk. The spot quickly evolved into what's called a delta region, in which the lighter areas around the sunspot, the penumbra, exhibit magnetic fields that point in the opposite direction of those fields in the center, dark area. This is a fairly unstable configuration that scientists know can lead to eruptions of radiation on the sun called solar flares. The glow seen here comes from the longer-wavelength, or far, end of the infrared spectrum, giving astronomers the chance to identify the very coldest dust in our galactic neighbor. These light wavelengths span from 250 to 500 microns, which are a quarter to half of a millimeter in size. 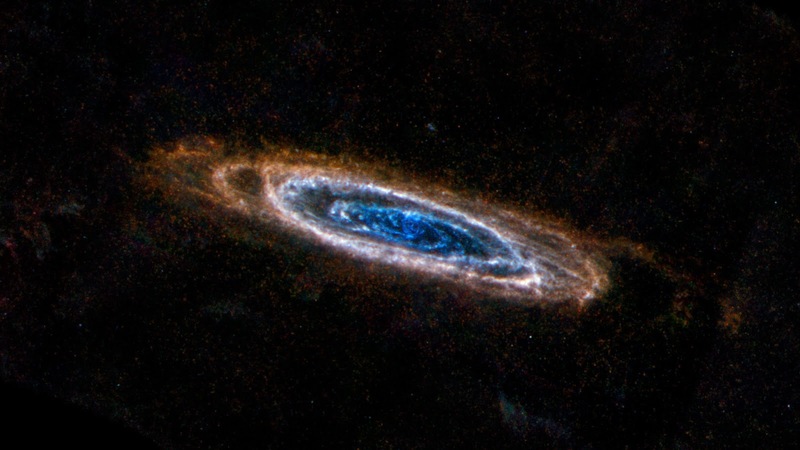 Herschel's ability to detect the light allows astronomers to see clouds of dust at temperatures of only a few tens of degrees above absolute zero. These clouds are dark and opaque at shorter wavelengths. The Herschel view also highlights spokes of dust between the concentric rings. These observations were made by Herschel's spectral and photometric imaging receiver (SPIRE) instrument. The data were processed as part of a project to improve methods for assembling mosaics from SPIRE observations. Light with a wavelength of 250 microns is rendered as blue, 350-micron is green, and 500-micron light is red. Color saturation has been enhanced to bring out the small differences at these wavelengths. 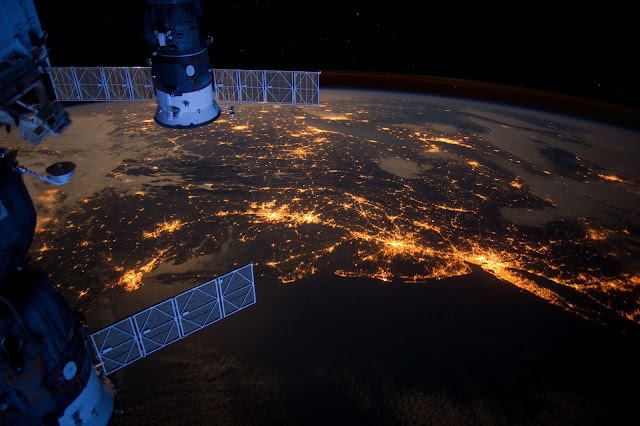 One of the Expedition 30 crew members aboard the International Space Station took this nighttime photograph of much of the eastern (Atlantic) coast of the United States. Large metropolitan areas and other easily recognizable sites from the Virginia/Maryland/Washington, D.C. area spanning almost to Rhode Island are visible in the scene. Boston is just out of frame at right. Long Island and the Greater Metropolitan area of New York City are visible in the lower right quadrant. Large cities in Pennsylvania (Philadelphia and Pittsburgh) are near center. Parts of two Russian vehicles parked at the orbital outpost are seen in left foreground. Two dark shadows loom across the banded and mottled cloud tops of Jupiter in this sharp telescopic view. In fact, captured on January 3, 2013, about a month after the ruling gas giant appeared at opposition in planet Earth's sky, the scene includes the shadow casters. 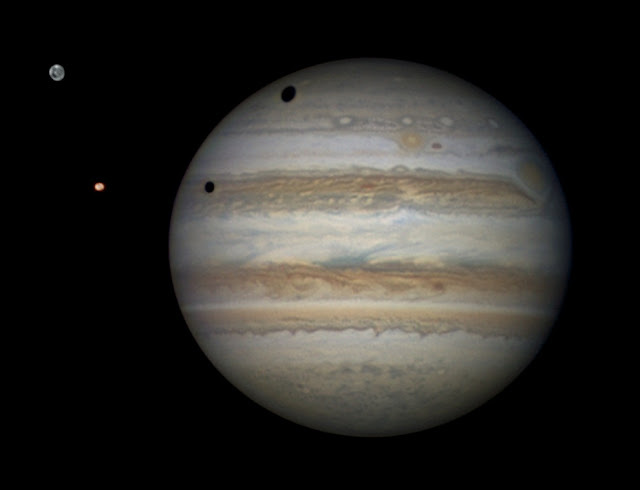 Visible in remarkable detail at the left are the large Galilean moons Ganymede (top) and Io. With the two moon shadows still in transit, Jupiter's rapid rotation has almost carried its famous Great Red Spot (GRS) around the planet's limb from the right. The pale GRS was preceded by the smaller but similar hued Oval BA, dubbed Red Spot Jr., near top center. North is down in the inverted image. 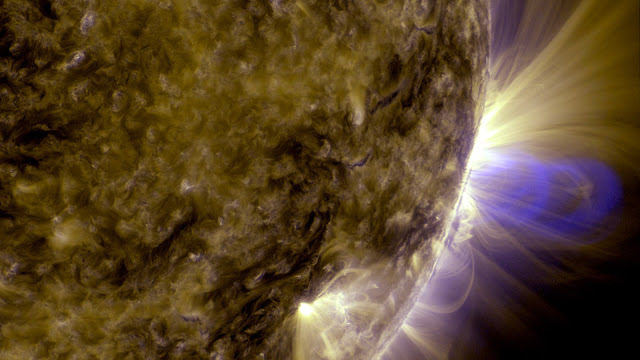 This is an image of magnetic loops on the Sun, captured by NASA's Solar Dynamics Observatory (SDO). It has been processed to highlight the edges of each loop to make the structure more clear.